Retrieve a book from the Count of Skingrad. Speak with Raminus Polus. He tells you to travel to Skingrad and retrieve a book from the Count. When you arrive at Castle Skingrad, you will be directed to Mercator Hosidus who says the Count will see you tomorrow. The next day, Mercator will tell you the Count has agreed to meet you away from prying eyes at 2am, north of Cursed Mine. Go to the meeting point, which is actually southeast of the mine, where you are ambushed by Mercator and his fellow Necromancers. 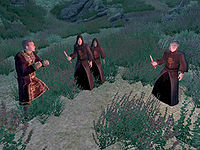 The Count of Skingrad will also arrive during the fight. Afterwards, the Count speaks to you about the delicate relationship between himself and the guild, a pretense you can see in his eyes. When all is understood, return to Raminus for a promotion and the Spelldrinker Amulet. After completing A Mage's Staff, speak to Raminus Polus to receive your next task, which is related to the Necromancers you found at Wellspring Cave. All he wants is for you to retrieve a book from Janus Hassildor, Count of Skingrad. He warns you that Skingrad can be an "unusual place". Head over to Castle Skingrad and speak to any guard to learn that all appointments with the Count must go through Mercator Hosidus. Find Mercator in the Castle County Hall during the day. It seems the Count is aware of your presence but doesn't feel like granting you an audience at the moment. Mercator suggests trying again tomorrow. Return a full day later and speak to Mercator. It seems the Count has agreed to meet with you but not in the castle. Instead you're meeting him north of Cursed Mine at 2am. The mine is just west of town; although the quest log says to meet north of the mine, it actually means southeast, next to the field of grapes at Tamika's vineyard (follow your quest compass). Wait around until 2am (Mercator actually comes around 10pm). Unfortunately, it seems that Mercator tricked you and the Count is not coming. In fact, Mercator and his fellow Necromancers (namely Arterion and Mondrar Henim) have come to kill you. Fortunately, you have an ally as the Count himself appears during the ensuing fight. If you are having trouble with this fight, run towards the gate. If you are having trouble getting to the City Guard in time, initiate speech with Mercator while standing on the fence. After the dialogue, jump down and run to the guards. This will net you a few extra seconds to get away. The guards there will help you. After the Necromancers are dead, the Count will chew you out for being a gullible fool and demand you thank him for "saving" you, even if you killed all the enemies before he even showed up. In the dialogue with Janus after the battle, you learn that he suspected Mercator was allied with the Necromancers, but needed to know just how many others were with him before acting. He also explains that the Mages Guild was actually using you to spy on him to see what connections he had with the Necromancers. Janus tells you to explain to Raminus that he had no connections with the Necromancers and that they should not send anyone else under false pretenses. Return to Raminus, who apologizes for putting you in such a situation. It seems the Count is actually an ally and the guild was worried that sending a higher official would bring too much attention to the tenuous relationship with the Count. After completing this quest, you will ascend to the rank of Evoker, whereupon you will receive the Spelldrinker Amulet. If you give Mercator Hosidus the runaround and sneak into the Count's manor, Janus Hassildor's conversation topics will only consist of Rumors and Skingrad. The quest cannot be advanced using this method. Once you have completed this quest you may hear Mages Guild members commenting on situation: "I've heard that the Council of Mages is taking advice from outsiders. I'm not sure how I feel about that." An achievement will be unlocked upon being promoted to Evoker. After waiting for 24 hours or more, Mercator may keep telling you it hasn't been 24 hours yet. To fix the problem, wait until it's the same hour of the day or later before talking to Mercator again. Once you have reached stage 40 of this quest, Janus may refuse to talk to you. Although this is not a problem in completing the Ulterior Motives quest, it can prevent progress in any other quests involving Janus (in particular, Vampire Cure and Allies for Bruma). To fix the problem, you simply need to talk to Raminus Polus in the Arcane University and select the "Janus Hassildor" dialogue option. When being directed to the location of the meeting for stage 30 of the quest, you are told "He wishes to meet with you north of the Cursed Mine outside of town, after 2 AM." except the meeting location is definitely southeast of the mine. Both the audio and text are wrong here. Sometimes Mercator doesn't appear in Castle Skingrad. No way around this has been found. ? Try following your red arrow to the locked door. Unlock the door, enter the room. Upon exiting the room again, Mercator may be available. After the battle, Janus may only have standard dialogue available. ? Open the console, click on the count, and type startconversation player mg09choice1a. 10 Raminus Polus has asked me to retrieve a book from Janus Hassildor, Count of Skingrad. 20 Mercator Hosidius, a liason to the Count of Skingrad, has told me the Count is not accepting visitors. I need to return tomorrow. 30 Mercator Hosidius told me the Count will meet with me North of the Cursed Mine west of town at 2 AM. 40 Count Hassildor saved me from the ambush set by Mercator Hosidius. I need to deliver his message to Raminus Polus. 100 Finishes quest I've delievered [sic] Hassildor's message to Raminus Polus. It is possible to use the console to advance through the quest by entering setstage MG09Motives stage, where stage is the number of the stage you wish to complete. It is not possible to un-complete (i.e. go back) quest stages. See SetStage for more information. Esta página foi modificada pela última vez à(s) 09h09min de 15 de agosto de 2015.